UPDATE: After 14:00 on Wednesday, the Sahara website became inaccessible. Just after 15:00, both the ANN7 and The New Age websites went down (see tweet below). But after 16:00, both the ANN7 and The New Age websites were up again. But despite these threats, the ANN7 and The New Age websites were still operating normally past 13:00 on Wednesday, putting into question the hacktivist’s promised attacks. Spokespeople at ANN7 and The New Age could not be reached for comment on Wednesday afternoon. Anonymous Africa said it has also targeted the website of Gupta-linked computer company Sahara on Wednesday. What are your thoughts on Anonymous Africa's recent noises about hack attacks? Tell us your view by clicking here. Representatives at Sahara were not willing to comment on the matter when Fin24 contacted the company on Wednesday afternoon. The representatives instead referred Fin24 to the computer company's holding group, Oakbay Investments. The Gupta brothers and President Jacob Zuma's son Duduzane Zuma earlier this year resigned from Oakbay Investments and Oakbay Resources and Energy. However, the Gupta brothers remain dominant shareholders in the companies. Fin24 has contacted Oakbay for comment and will update this story when the company responds. 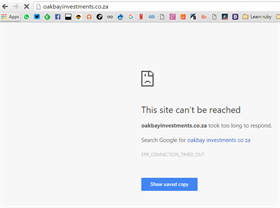 Coincidentally, websites belonging to Oakbay Investments and Oakbay Resources & Energy were inaccessible at 13:55 on Wednesday, but it was unclear what the exact cause of this could be. Anonymous Africa said focus on the Gupta's businesses comes amid allegations of state capture having swirled around the family and President Jacob Zuma this year. However, Anonymous Africa has linked itself to attacks on other major South African websites this week. On Sunday, public broadcaster the SABC confirmed to Fin24 that it was the subject of a hack attack that resulted in several of its websites going down for hours on that day. Anonymous Africa claimed responsibility for the attack while the SABC said it was investigating the matter. Anonymous Africa said it carried out the attack in light of allegations of creeping censorship at the SABC. Then on Tuesday, Anonymous Africa threatened to down the website belonging to political party the Economic Freedom Fighters (EFF) and Zimbabwe’s Zanu-PF. The hacktivist group said it was attacking the EFF website because of what it said was the political party’s alleged “racisim”. The EFF website subsequently experienced several hours downtime on Tuesday amid the threats, according to reports. In its said attacks this week, Anonymous Africa has said in tweets that it’s using what is called a ‘Distributed Denial of Service’ (DDoS) method. This method typically involves using compromised computers on a network to flood a web server with thousands of requests that often temporarily disrupt a website’s services.